Jennifer Carden is a Chef, Author and Spokesperson dedicated to inspiring cooks of all ages to have fun and be creative when preparing meals. Carden’s innovative ideas and humorous slant on feeding children led her to develop the popular cookbook, The Toddler Café (Chronicle Books 2006). More than just providing recipes for parents who want simple, clean, uncomplicated food, she creates ingenious recipes that help families spend time together in the kitchen, effortlessly blending food and fun. Carden lends her expertise across multiple platforms; television, print, internet, cooking school and, most recently, to Kidsline, Inc, the makers of The Ultimate Baby Food Center by Baby Chef brand. Jennifer established a name and reputation throughout the food industry as an accomplished chef and passionate worker as is evidenced by the work she is doing and the company she keeps. Her book, The Toddler Café (Chronicle Books, 2008), received acclaim for its innovative approach to feeding children and applause from parents seeking to bring fun to mealtime. Packed with easy creative recipes, The Toddler Café teaches parents how to quickly turn a few healthy ingredients into family fun. The Toddler Cafe has become a popular destination for parents around the world. 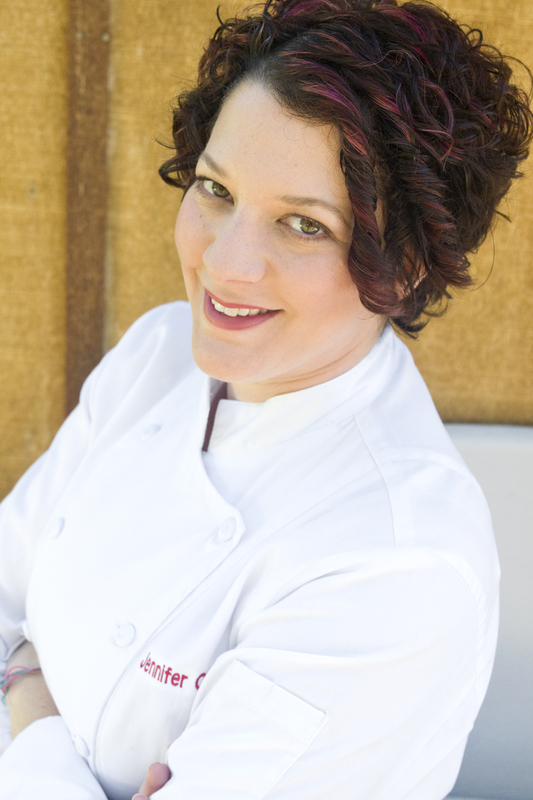 Jennifer is Cofounder and instructor-partner of Dirt to Dine Adventure Camp for Budding Chefs in conjunction with famed chef Michael Chiarello and his wife Eileen Gordon in Napa. Jennifer was recently selected to lend her expertise to Baby Chef, the newly launched line of baby food appliances by Kidsline, Inc. Using her personality, recipes and ability to professionally represent the product at trade shows, Kidsline is enjoying brisk sales. Chef Jen is frequently asked to appear on food segments of morning news programs and is a contributor to multiple successful cookbooks, including the new Elizabeth Pantley book The No Cry Pick Eater Solution. Jennifer also appears on the BEAN Network, for Bush Brothers Beans, making sure people know beans are a healthy source of protein. She has also worked with acclaimed chefs in television and print such as Jacques Pepin and Molly Katzen. In addition, she is a regular contributor to many publications, such as Edible Marin Wine Country and websites like Nickolodian Kids. Jennifer is in the process of creating The Family Room, an innovative restaurant where parents and kids can enjoy healthy, delicious and fun food in a relaxed setting. She lives in the San Francisco Bay area with her Husband and daughter. I have your book , The Toddler Cafe. I also have a cooking blog and really enjoy developing my own recipes. My goal is to publish a cookbook with a lot of my recipes in it. Would you mind giving me some advice. I don’t know where to start as far as finding a publisher or things like that. I would love to hear from you. My email address is eb.lauren@gmail.com. My blog is 1cookingchick.com. Hello Jennifer, I love your website and all of your recipes! I have a new series on my blog called What’s For Lunch Mommy, which focuses on some simple and healthy toddler eats. I’m looking for a few great ideas and guest bloggers for the series. I would love to have you be a part of this series! Would you be interested? Hi Jennifer, I have nominated you for the Sunshine Award! I wanted to reach out and see if you’d be interested in reviewing our new Honest Kids line or doing a giveaway (reformulated to eliminate the organic cane sugar, and always gluten-free, organic, kosher, and never contains any high fructose corn syrup). Let me know!